Jewish studies lecturer at Northwestern University says a stranger asked him if he was Jewish and then performed a Nazi salute. A Jewish studies lecturer at Northwestern University in Evanston, Illinois, said a stranger asked him if he was Jewish and then performed a Nazi salute and said "Heil Hitler." The unnamed lecturer said the man approached him in a vehicle last month near the campus Hillel building, The Daily Northwestern reported Monday. The director of Northwestern Hillel, Michael Simon, called the event an act of “blatant anti-Semitism,” and said he had asked campus police to increase patrolling of the Hillel building as well as the campus Chabad house and the Jewish Alpha Epsilon Pi fraternity house. Northwestern Police Deputy Chief Gloria Graham told the Daily Northwestern that there would be additional patrolling around the Hillel building at least until the beginning of January, when the university's winter break ends. Earlier last month, books related to Islam and the Quran in the Evanston Public Library were discovered defaced with Islamophobic, homophobic, anti-Semitic and racist language, according to The Daily Northwestern. Both incidents in Evanston occurred after the presidential election amid a nationwide increase in anti-Semitic and other hate crimes. JTA has reported on anti-Semitic incidents following the election, including acts of vandalism featuring swastikas and Trump-related themes left in public areas as well as on the homes of Jewish individuals. On Monday, the New York Police Department said it has seen a dramatic rise in hate crimes following the election of Donald Trump, with the majority of incidents directed at Jews. 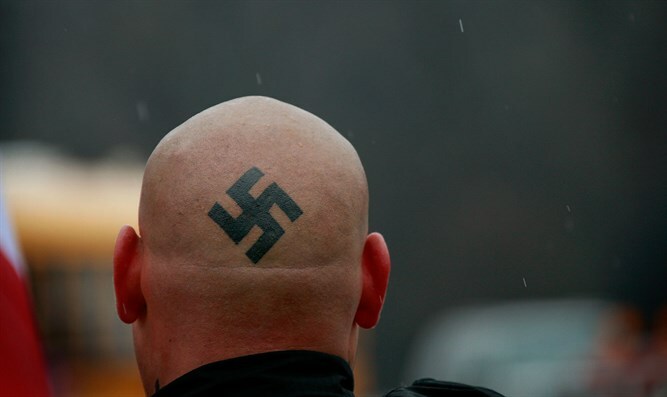 The head of the Anti-Defamation League, Jonathan Greenblatt, said recently that anti-Jewish public and political discourse in America is worse than at any point since the 1930s.